Five years ago, chronic procrastinator Maneesh Sethi hired a woman via Craigslist to slap him in the face any time he strayed off task. The $8-per-hour investment in "Kara The Slapper" quickly paid big dividends, as Sethi quadrupled his productivity AND spawned the concept of Pavlok, a bracelet that can deliver a behavior-altering jolt with the tap of a button. The idea is based on the 80-year practice of aversion therapy. Each time the user exhibits the undesirable behavior, he or she touches the Pavlok button to self-administer a punishing shock. Over time, the user's brain subconsciously associates the bad behavior with the negative result and the bad behavior is eradicated. The Pavlok website says that the device can be used to break a number of bad habits, including smoking, mindless eating, nail biting and watching too much TV. A New York Times reviewer noted that the zap could be adjusted from 50 volts (a strong vibration) to 450 volts (like getting stung by a bee with a stinger the size of an ice pick). A police Taser, the writer pointed out, typically delivers about 50,000 volts. The selected intensity of the Pavlok shock can be adjusted with a smartphone app. Another critic wrote that the Pavlok device was simply a high-tech version of the rubber band, which is sometimes used by patients who are trying to combat anxiety and other disorders. Those patients are instructed to simply put the band around their wrists and deliver a stinging snap to break thoughts related to anxiety, panic and fear. 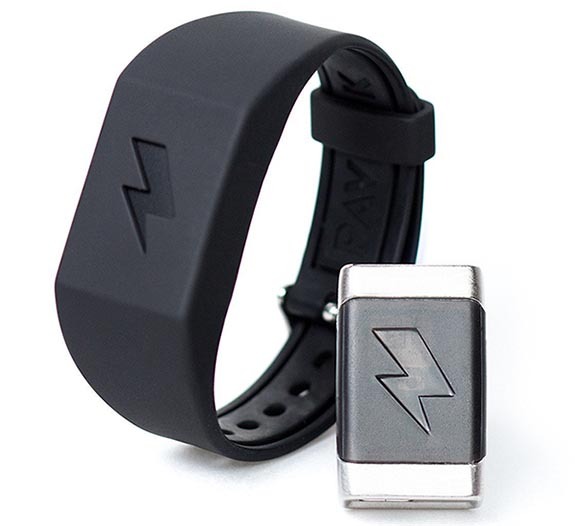 In 2014, Pavlok got off the ground by generating $284,027 via the crowdfunding site Indiegogo. Today, Pavlok's website boasts more then 40,000 units sold and a slew of video testimonials, including the one from Heather, who credited Pavlok with helping her break a 25-year nail-biting habit, and Carlos, who quit smoking in just five days. The Pavlok device pairs a silicone, battery-powered shock-inducing bracelet with a Bluetooth-connected mobile app designed for iOS and Android smartphones. In addition to the self-induced shocks, the device can be set to deliver a stimulus, for instance, if one has been sleeping or resting too long. The device also employs a hand-detection function that can sense if the user might be biting her nails, pulling her hair, or smoking a cigarette. The battery can deliver 150 tiny jolts on a single charge. What's more, the app includes a five-day guided audio course on how to reverse bad habits. Pavlok is available in five colors and sells for $179. Engage, Upgrade & Restyle Event! As seen on NBC's "The Morning Blend"
How Much Should I Spend? Craig Husar Fine Diamonds & Jewelry Designs is ranked among the Top 5% of jewelers in North America and has earned exclusive membership in the American Gem Society by adhering to the highest standards of business practices and ethics. Craig Husar is Google Rated 4.9 Stars (300+ reviews) and has also received the highest rating of A+ by the Better Business Bureau. Proud members of Retail Jewelers Organization, Jewelers of America, and the Gemological Institute of America Alumni Association. Craig Husar Fine Diamonds & Jewelry Designs (a division of Lyle Husar Designs, Inc.) is not affiliated with Husar's House of Fine Diamonds of West Bend. We proudly support the Diamond Empowerment Fund, an international non-profit organization supporting education initiatives in diamond producing countries. A portion of your purchase will support the empowerment of youth from these diamond producing countries by increasing access to higher education.